Read by Bruce Springsteen, a 16-CD set. Order now for a FREE poster: In addition to the above discount, ordering now will guarantee you a free 11x17 folded poster of the book cover, featuring Frank Stefanko's beautiful "Corvette Winter" shot. Simon & Schuster has provided these promo posters as an exclusive bonus for Backstreet Records customers. 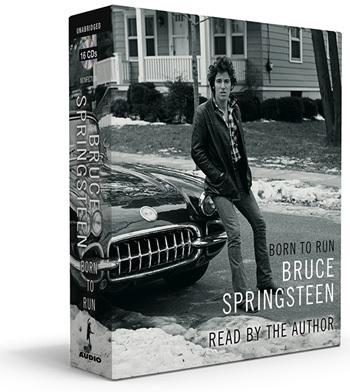 Bruce Springsteen narrates the audiobook edition of his critically acclaimed, #1 New York Times bestselling memoir Born to Run., 18 hours and 16 CDs from Simon & Schuster Audio. In addition to his narration, Springsteen recorded musical transitions for the audiobook at Stone Hill Studio in New Jersey. Excerpts from the original studio recordings of "Living Proof," "Long Time Comin'" and "Born to Run" are also featured in the audiobook.